AirMagnet Survey is the industry’s most accurate wireless site survey software solution for mapping, planning and designing 802.11n/a/b/g/ac wireless LANs for optimal performance, security and compliance. 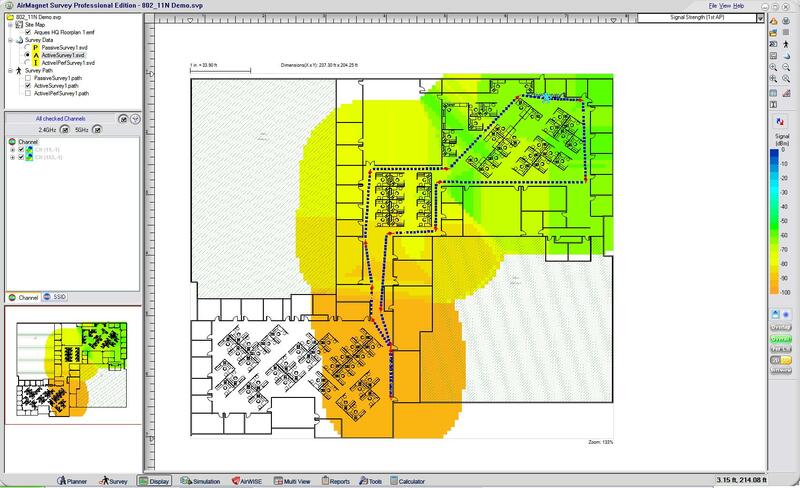 This wireless 802.11n site survey software calculates the ideal quantity, placement and configuration of APs for a successful wireless LAN deployment. AirMagnet Survey Pro goes beyond just verifying RF coverage, by plotting actual end-user network performance in terms of connection speed, throughput and packet statistics. The end result is a complete Wi-Fi “weather map” of all critical RF and end-user performance metrics helping users deploy the network correctly the first time and prevent costly rework & IT complaints. This is critical not only for guaranteeing the highest level of user satisfaction, but also helps wireless 802.11n site survey users like System Integrators maintain their margins on a project and maximizes the chances of getting repeat business. Advanced features of this wireless 802.11n site survey software allow users to integrate with professional spectrum analyzers to collect Wi-Fi and non Wi-Fi data in a single walkthrough, model pre-deployment scenarios to estimate budgets and define the migration strategies to new technologies, generate customized survey reports, perform outdoor surveys using GPS devices, conduct Voice over Wi-Fi site surveys to design the network to be voice-ready certify the network for end-user network and application requirements, and do detailed end-user capacity planning.